Linda Longhurst and Frank O'Neil listen to instructions. Larry Green checks out the progress. Everyone looks on as Larry explains. Doug Rounding sands his spine. Becca Osmon looks on as Larry explains one of the steps. Frank concentrates on the project. Billy Osmon cuts his spine as Mom Barb and his little sister Becca look on. Now it's Becca's turn to help. Larry teaching. He did a great job. Showing one of the final steps. 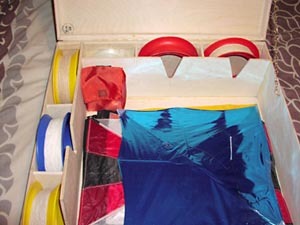 Here is Larry's poor old kite box. Notice the crushed edge that I 'accidently' stepped on! Here it is after I 'accidently' stepped on it a few more times! I did make sure it was empty before stepping on it though! Here I present Larry with a new fighter box for his involvement with the workshop and as a birthday present. Larry, for the first time since I met him, was at a loss for words. 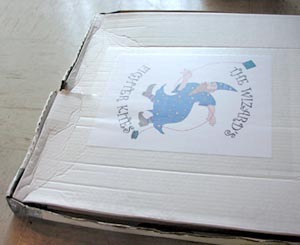 The kite box with his Wizard graphics burnt into it. It seemed that the only one who didn't know about it was Larry. Here it is filled with 'goodies'. The orange pouch contains his FairStart timer and is held in place with Velcro.